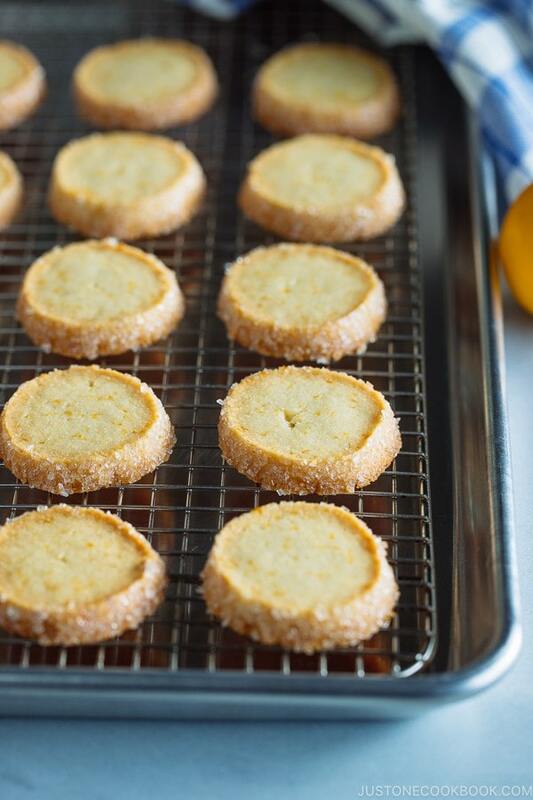 Chinese Almond Cookies are simple, crisp, buttery, and full of almond flavor. It’s a perfect treat to make for Chinese New Year! These Chinese Almond Cookies are one of the easiest cookie recipes I’ve tried. All you need is simply combine all the ingredients in a bowl, roll into small balls, and bake in the oven for 15 minutes. The cookies are crisp, buttery, and full of almond flavor! 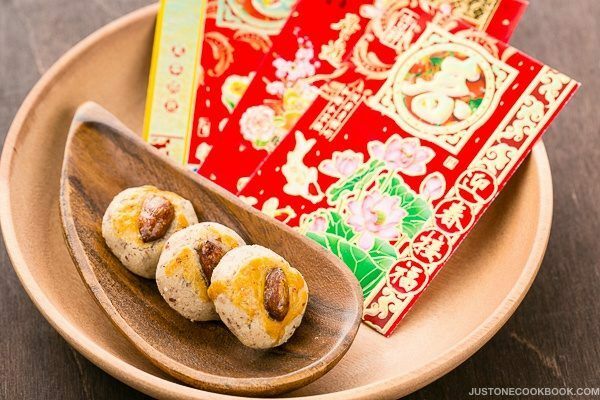 Chinese Almond Cookies for Lunar New Year! 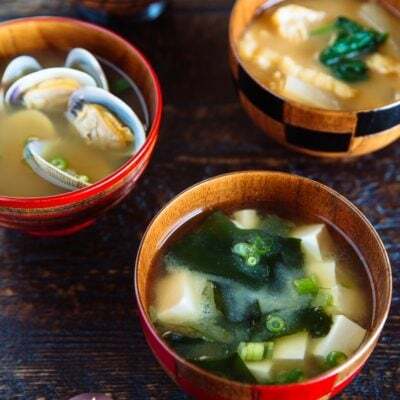 In Japan, we celebrate the New Year on January 1st (read more). As I married a Taiwanese American husband, I started to celebrate Lunar New Year as well. 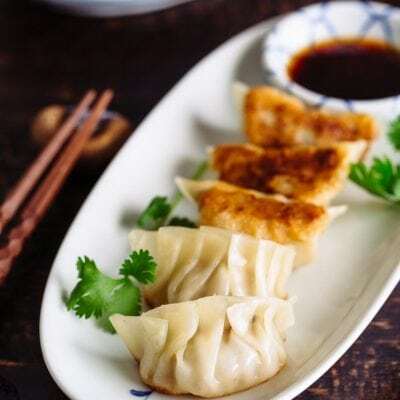 Since the holiday is a regular day here in the U.S., we typically go out to eat at Chinese restaurants to celebrate with his family and friends instead of cooking up a storm like most families do in Asia. One exception is I make these almond cookies. I learned from my Chinese blogger friends in Asia that these traditional Chinese almond cookies are enjoyed during the Lunar New Year. 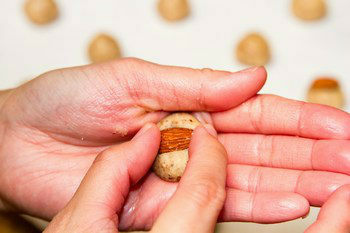 Almond cookies symbolize coins so people make or buy these cookies to bring good fortune. Almond cookies have a crisp bite and sandy crumbly texture. When you bite, almond meal/flour and almonds on top give really nice almond flavor in your mouth. These cookies are delightful with a cup of tea or coffee. Almond meal and almond flour both consist of ground almonds, but almond meal is a coarser grind made from almonds with their skins while almond flour is ground more finely and usually made from blanched almonds without skins. The only real difference is in how they look. 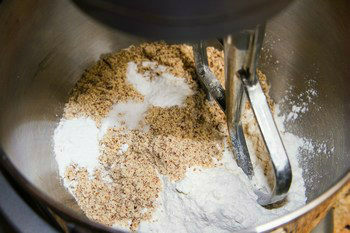 Almond meal is speckled with bits of almond skin, while the blanched almond flour is a creamy tan. 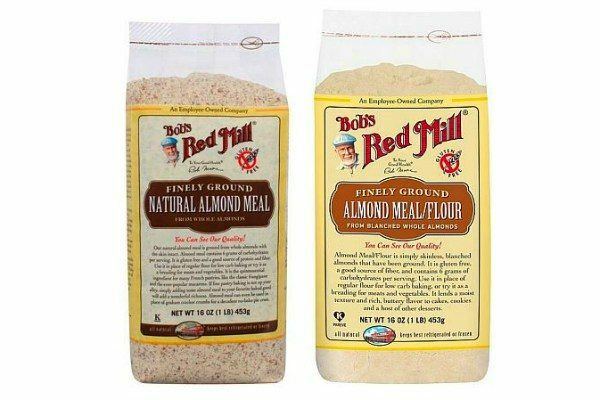 The almond meal that I use is from Trader Joe’s, but Bob’s Red Mill has both types (Natural Almond Meal vs Almond Meal/Flour). By the way, if you’re wondering whether only almond meal/flour can be used to make these Chinese almond cookies, my answer is no. Almonds don’t contain any of the gluten that flour contains, so we need to mix with flour to make the right texture for these cookies. 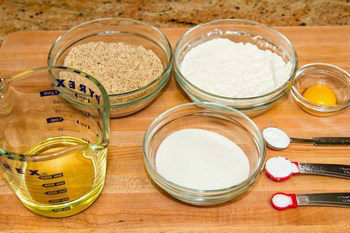 If you have almond extract (I use them for my pancake recipe too! ), you can drop a few extract for even more intense almond taste. 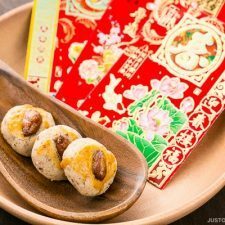 Serve these cookies for the upcoming Chinese New Year and if you celebrate this holiday. I hope you have a wonderful celebration with your family and friends. 恭喜發財 (Gong Xi Fa Cai)! I hope you enjoyed this Chinese almond cookie recipe! If you make this recipe, snap a picture and hashtag it #JustOneCookbook. I love to see your creations on Instagram, Facebook, & Twitter! 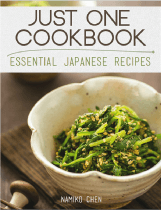 Thank you so much for reading and trying the recipes! Chinese Almond Cookies are simple, crisp, buttery, and full of almond flavor. It's a perfect treat to make for Chinese New Year! Gather all the ingredients. Center a rack in the oven and preheat the oven to 350F (180C). 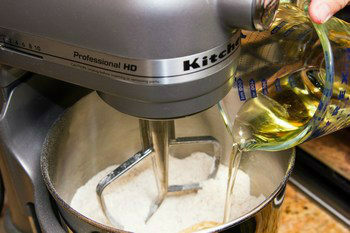 Combine all the dry ingredients in a stand mixer. With your mixer on low medium speed (with the beater attachment), mix all together. 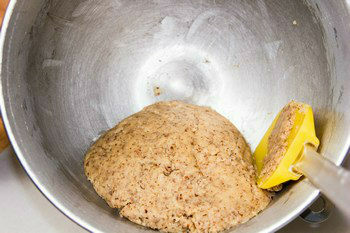 Slowly add oil and mix until a cohesive dough forms. The dough should be just enough to hold its shape when you try to roll into a ball. If they look more like crumbs, add 2-3 tsp. (10-15 ml) vegetable oil at a time. Weigh the dough to make 0.4 oz/10 g (1 inch cookies) OR 0.7 oz/20 g (1 1/2 inch cookies) rounded portion and roll it into a ball with your palms. Place it on a baking sheet lined with parchment paper and repeat until all the dough is used up. You can make a 10 gram ball using a teaspoon measuring spoon. (OPTIONAL) If you want to put a piece of almond on the cookie, hold the cookie ball on your palm and gently press the almond into the dough. Beat the egg yolk in a small bowl. 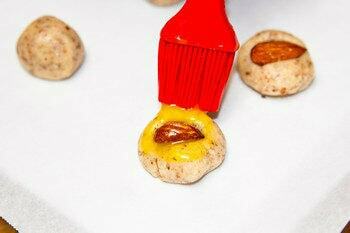 Using a pastry brush, lightly glaze the top of the cookie balls with the egg yolk. Bake at 350F (180C) for 15-20 minutes, or until the cookies become slightly golden. Let them cool on a wire rack and store in an air tight container. Almond Meal/Flour: If you use almond meal/flour with skin (the brown bits), you may need to add more oil. Adjust the oil amount as you combine the dough. You should be able to make the dough into balls. Slightly adapted from Through The Kitchen Door, originally from My Secret Recipe Series: New Year Cookies by Alan Ooi. Editor’s Note: This post was originally published on February 10, 2013. The content has been updated with more information. Oh my….. I am glad to see you made this! Thank you trying out this recipe as this is my favourite cookies for the CNY. I hope those who have tried this enjoyed it as much as I do. Thank you for the link back. GONG XI FA CAI to you and to your family! Thanks these look delicious. I’m going to try making them with gluten free flour and minus the egg-yolk glaze. My partner has allergies. Hello Fiona! 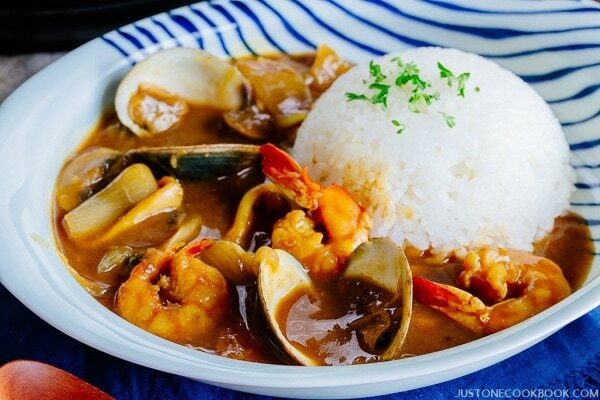 I hope you and your partner will enjoy this recipe. 🙂 Thank you for writing! Happy Chinese New Year, Nami-san. Wow wow I am so excited to receive your entry to my event ! Ya, this cookie is easy to make but yet very additive . This year I made peanut cookies instead…thanks again ..
love anything with almonds in. Those cookies look really good, Nami. Cute cookies! They must taste wonderful. This looks better than the storebought ones. Happy new year! Thank you Kimmi! We really enjoyed these and I’m going to make them again soon. 🙂 Happy Lunar New Year to you and your family! Nami, these look so scrumptious! And your pictures are stunning! Great looking cookies! And so easy. And they look awfully tasty. Good photos, too. This is just an all around good post! Happy Lunar New Year! And thanks for this. Happy Chinese New Year! These Almond cookies are so delicious! I always thought these treats were a little harder to make. 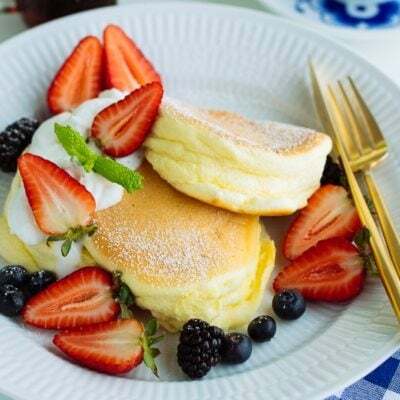 I appreciate for the easy recipe. Great post! Thanks for sharing! I have only had these cookies out of a box so I can’t imagine how delicious they are fresh. They look so good! 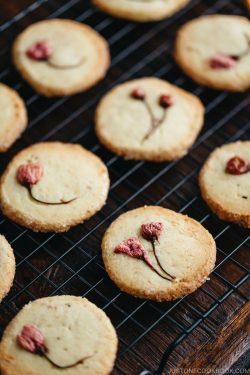 The only almond cookies I’m familiar with are more of a shortbread version with butter, flour and ground almonds and shaped into little crescents but this does seem quite easy to put together and the almond half on top makes it look very pretty. 恭喜發財! These almond cookies look delicious. Can you tell me if the texture of the cookies are crunchy? My family likes crunchy cookies. These look yummy! Thanks for posting, Nami ! Where can I find almond meal? I don’t have a Traders Joe close where I live. & what kind of almonds do you use for decorating the cookies? Thanks!! Hi Grace! You can find it at a regular grocery store. My closest store carries Bob’s Red Mill Almond Meal/Flour. Hope you can find something like this brand. For almonds, I used roasted unsalted almonds. I’ll update in my recipe. Thank you for asking! I love almond treats, what adorable cookies! I used to eat these all the time when I was little. As I grew older, my parents didn’t buy them anymore. Haha. Mmh, the almond cookies look so inviting! 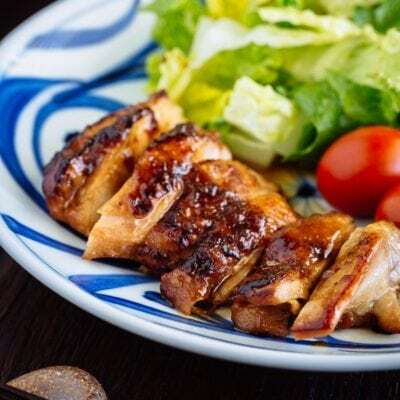 It’s fantastic that they are so easy to prepare as well, great recipe. Gong Hei Fatt Choi, Nami!! They look beautiful with the golden eggwash! 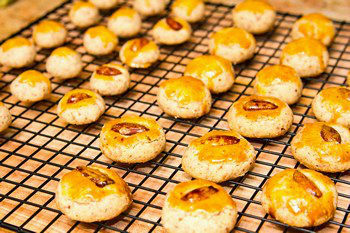 I also made some almond cookies for CNY this year – I love the nuttiness! May your family be blessed with health, happiness and success in the year to come! Happy Chinese new year to you and your family, Nami. I love the crumbly texture of these sort of cookies. I also like the hint of salt. These are so simple yet so festive. It makes them that much more addictive! I’ll just substitute in banana for the egg, and I’ll have one vegan almond cookie. Thanks for the recipe! gorgeous photos! 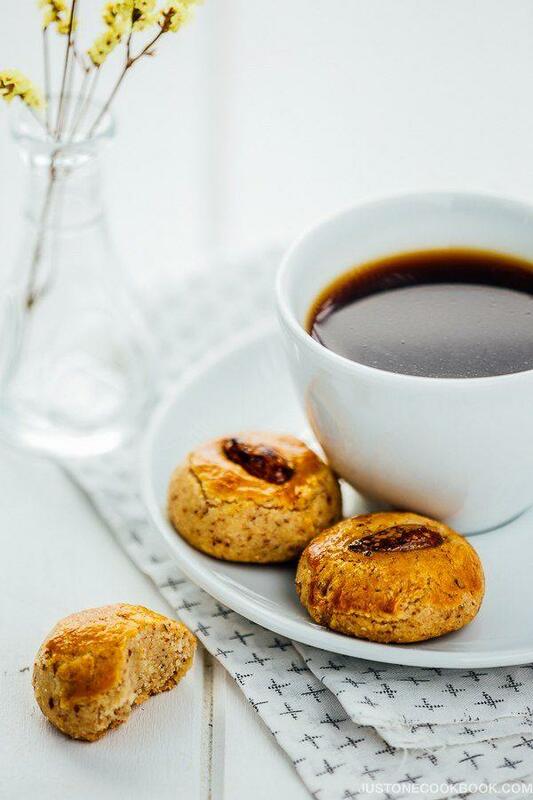 these sound wonderful, perfect with a cup of hot tea! Happy Chinese New Year Nami to you and your family 🙂 Wishing you a very healthy and happy year!!! Oohhh these almond cookies look amazing and I’m very surprised at how easy it is to make them 🙂 really need to try making them soon! Delicious cookies… I like almond a lot and these look prettyt good! Brilliant idea, Nami! As you know, I have a big passion for simple and easy sweets and I know this doesn’t mean compromising with taste. 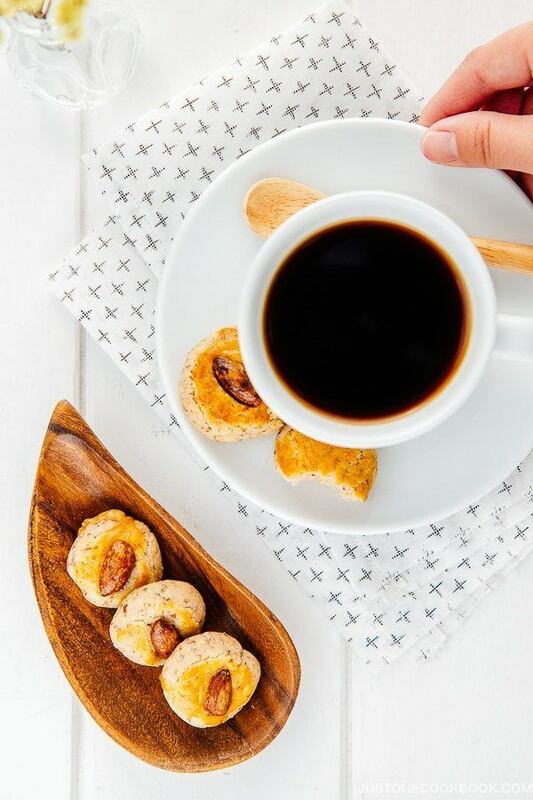 I wish I could have a cup of coffee with a couple of these… I will content myself with my prunes in chocolate (I have made a big batch yesterday), but after your beautiful photos I desperately need a sweet fix and coffee too! Maybe I should consider celebrating the Chinese New Year next year too 😉 Any excuse to eat delicious food it good. Such pretty cookies! Love those almonds on top. Beautiful! how beautiful, looks like a little gold plates on top of the cookies. Looks wonderful, and I know I would be addicted because I love almond taste especially when in cookies. Happy Lunar New Year & I wish you and your family fantastic year! I love almond cookies! Taste for the tip on grinding the flour; I’ve had the same thing happen to me before where it was just a bit too coarse. These cookies are so lovely and look very easy to make for Valentine’s Day! Thank you for sharing your recipe, Nami! Such perfect little cookies, I love using almonds in baking! I would love these! I don’t get to bake much with nuts because Gabbi is allergic to them. Maybe I’ll sneak a few of these in, they look good! This is my favorite CNY cookie, no kidding! They are very similar to those melt-in-your-mouth sugee cookies – also a popular CNY snack! 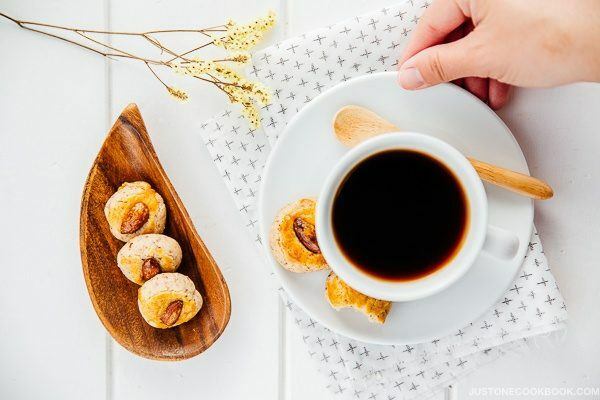 I use to have an “amaretto di Sassello” (wich is a soft almond cookie in this case, not a shot of liqueur…) every day after lunch with a cup of expresso. I love it! Now I’ll try your recipe too. Happy Lunar new year to you and your family Nami! Oh my! I miss having this on New Year. We usually have pineapple cookies/ tart and layered cake. But, these cookies look so delicious! Love your pictures so much. I made these last night for my little brothers, to put in their lunch-boxes today. They’re still at school, so I don’t know what they think of them yet 🙂 I had one this morning and it was so tasty! But is the sugar supposed to be crunchy in these cookies? If not, I might try using a finer grain of sugar (the one I used was really coarse white sugar). Sugar shouldn’t be crunchy. It’s more like sand texture (fine texture). I’m afraid your sugar was a bit coarse one (I have that kind too). Thank you so much for your feedback! 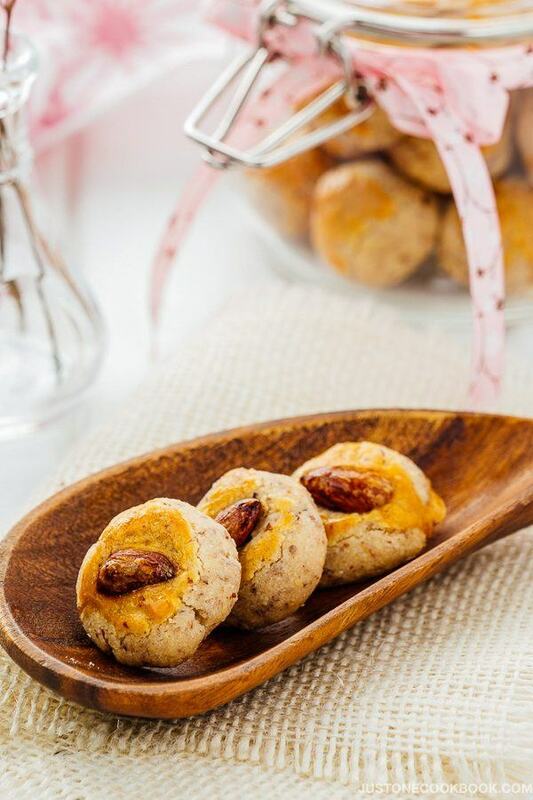 These cookies look so cute and easy to make… A loves almond so I am totally going to make these. 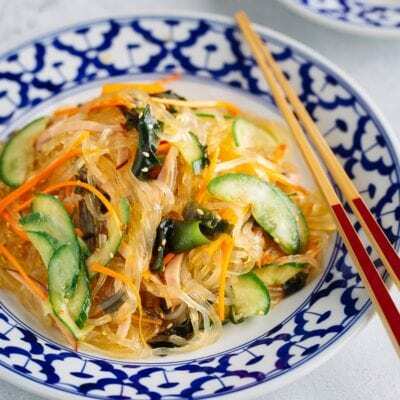 these are lovely to snack on, what a great way to ring in the year of the Snake! may this be an auspicious year for you and yours! Yesterday I bought the gluten free almond cookies from Galloway, They are delicious! 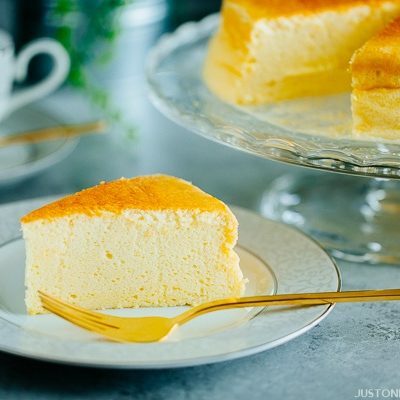 After reading your recipe I am thinking to try this at home. Oh By the way, Happy Chinese New Year to you and Your family! These look so great. And your photos are so lovely, as usual. I appreciate that you can put these together quickly. I love Chinese New Year and all the goodies I see around that time. I have tried that T.J.’s almond meal, but prefer Bob’s Red Mill, it’s much finer and no skin in it. I love almond cookies, I don’t need a holiday to eat them either, he he. Hope all is well with you. Love that large piece of almond sitting on top of the cookie! Nami, these cookies are right up my alley! 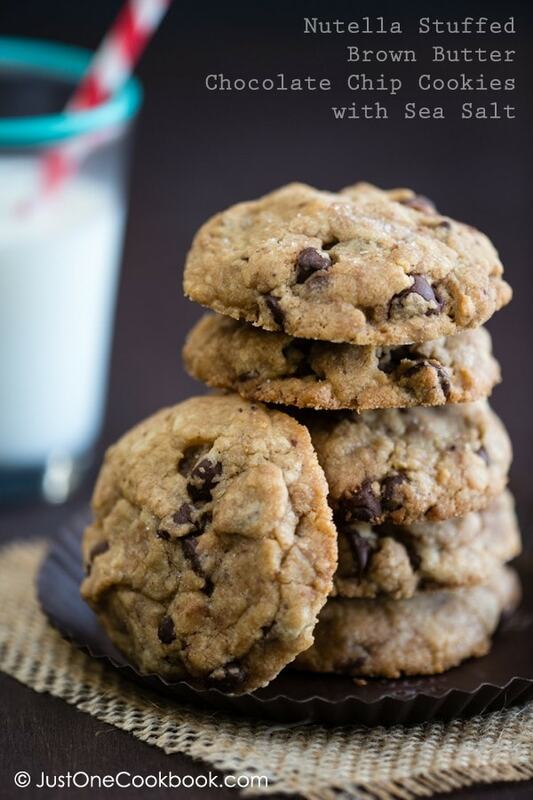 I’ve been obsessed with almond flour lately, and I know I’ll just HAVE to try these cookies! They look so good Nami. You are getting better and better in baking! I think you have a great baker in you waiting to come out, just like how good you are in cooking. Love these cookies! I love almond cookies! The texture of these looks different than recipes I’ve seen that call for almond paste. It must be the almond flour that does it. Looks wonderful! If the lunar New Year brings these little treats, then I’m definitely adopting it, Nami. These are gorgeous! I’ve only had sweet versions of almond cookies — generally a “sugar cookie” flavored with almond extract — almost too sweet. The way you described these as crumbly, salty, & sweet would make them addictive for me, too, Nami! 🙂 Happy New Year(s)! Nami your cookies are wonderful, of course I will prefer the bigger cookies with the almond on top, you can believe how much I love almonds. I would love to nibble on a couple of these with my morning cup of coffee! Happy Chinese New Year Nami. I am also a fan of quick sweets that taste wonderful (who isn’t) and these fit the bill. Way better then the dry cookies you get after a meal in my city’s Chinatown! Lately almonds became one of my favorite ingredients to use either in sweet or salty meals. These cookies looks great, I am sure they taste as good as they look. I’m late in all my greetings, so I am just going to pile everything on you today! Happy (belated) Chinese New Year and also Happy Valentine’s Day! You know me, I like simple and fast! These almond cookies are superb! They remind me of the ones I can get at dimsum places! Of course, everything trumps homemade, so I am sure your version is double delicious! That’s why, I am double happy 🙂 Have a wonderful and romantic day…! I am a true fan of Almond Cookies and finding the right recipe at times can be a true pain. These look yummy and very easy to make. Thanks for the recipe, Nami. These are gorgeous little treats! So wonderful and perfect with a cup of hot tea! Beautiful clicks! I just finished my last two cookies from my first batch~! These cookies were soooo good! I will definitely be making them again very soon. They were a hit with my whole family. The only issue I ran into was their crumbly texture as they had to be very carefully handled and the moment they hit my lips they fell apart. I didn’t mind that so much when they crumbled into my mouth, but into my napkin almost forced me to lick my napkin when no one was looking….That’s how good they are! I made my own almond meal with my mini food processor, I also used the almonds on top and brushed them with the egg yolk. Their presentation was absolutely wonderful. Thank you for the great recipe! Thank you so much for your feedback. I’m really glad you enjoyed them as much as we did! 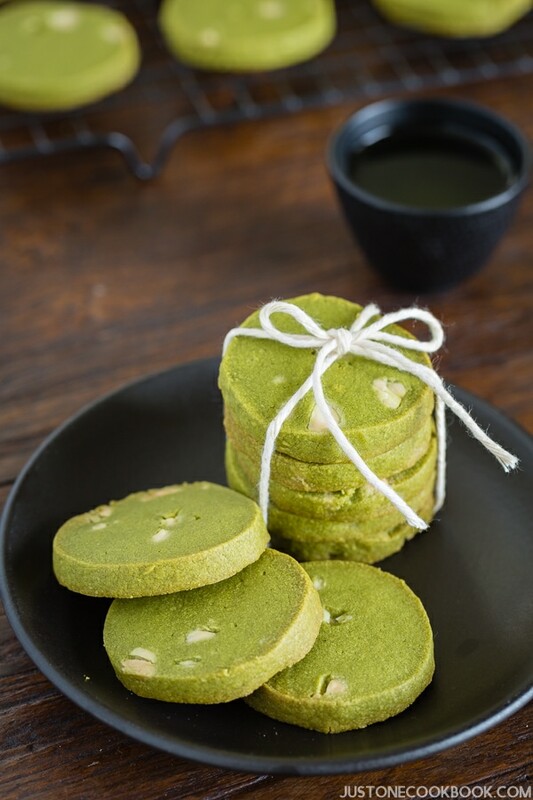 I enjoy simple desserts and your almond cookie sounds like the perfect ending to a meal or with a cup of tea. I would love some of these with a cup of hot “chai”. Simply wonderful! Hi Nami! I like the more rustic look that the almond meal with the skins gives your cookies. I’ve bought the skinless almond meal (finely ground almond meal flour from Bob’s Red Mill) for French style macarons -might be good to use in your cookie recipe!? I like the way your cookies look but I have some of the finely ground almond meal flour to use up, I love almond cookies, will have to give your recipe a try! Hi Brenda! I’m so happy to hear you liked the coconut macaroons (I made pineapple cakes and now got 3 egg whites, so coconut macaroons I guess? :D). Did you like these Chinese cookies? It’s salty and little sweet. Kind of unique flavor. I’m now used to more Chinese food/dessert so I enjoy the taste, but it’s a bit different from Western style cookies I suppose. Thank you so much for your feedback and I am happy to hear you like my recipes. Your kind comment made my day. Thank you! I remember these cookies growing up. I should probably start learning how to make them myself! Hi Yuli! I’m so happy you liked it. Asian cookies are not too sweet, which is always my favorite. 🙂 Thank you so much for your feedback! Thank you Nargiss! I’m sorry some ingredients are hard to find (I do feel it sometimes living here too). But I’m glad you’re trying my recipes. Thank you so much for your kind words! I just made these, but changed the oil for the same amount of unsweetened applesauce, the flour for a nutri-blend by robin hood and changed the sugar out for 4 and a half tbsp of Truvia sweetner. They turned out fabulous and a lot less bad for you! Love the flavor of these cookies, they are so rich and nutty. However, I used avocado oil instead of vegetable oil; the mix was lumpy and hard to roll into ball shapes; and the cookies just fall apart when picked up. Is it because avocado oil does not bind the ingredient well? You cannot imagine that as a Chinese living in Australia, how excited I was when biting into the cute almond cookie which was made from your recipe. 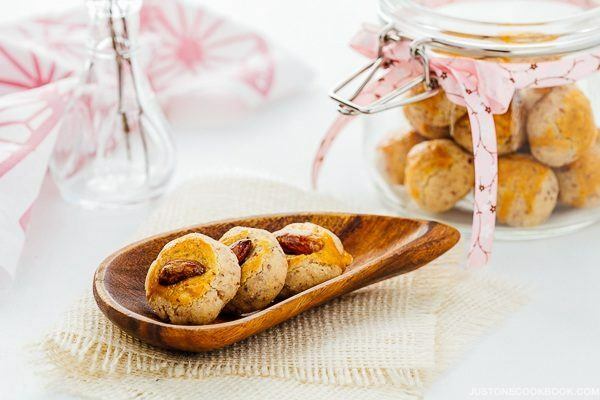 The base is really versatile and it is a traditional cookie dough in China, and I finally know how to make it. I devided the dough into two parts and added some chopped peanuts in one part of the cookie dough which turned out so great too. 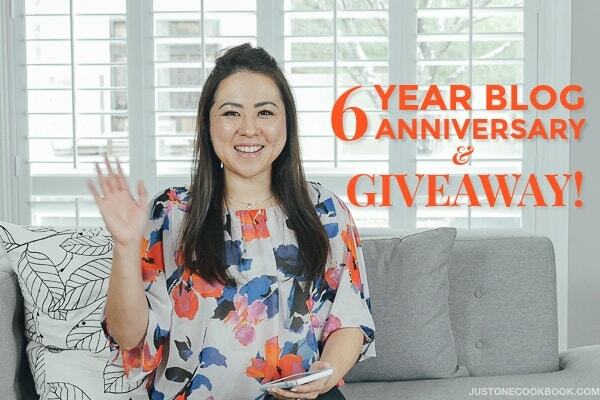 Huge thanks for your recipes and watching your videos has become my weekly routine(depending on how often you uploaded videos????). 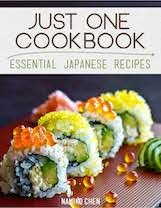 Hope you could make more recipes for hungry Asian people like me???????? Just need a clarification regarding the amount of granulated sugar. The recipe calls for 2/3 cup – 1 Tbsp. Does that mean 2/3 cup + 1 tbsp? Can’t wait to make it. Thanks. Hi Christina! 120 grams of sugar is 2/3 cup minus 1 Tbsp. In other words, scant 2/3 cup sugar. 🙂 Hope you enjoy this recipe! Ah that makes sense. I don’t know why I thought it was a hyphen instead of reading it as “minus”. Thank you Nami. Now that’s cleared up, I’ll be making them soon. Hi Christina! I’m sorry, probably not the best way to write it… I try to make it simple, but I’m glad you asked the question. 🙂 Hope you enjoy! No worries it’s my careless reading. Just baked them today and the kitchen smelled so wonderful. My dough wasn’t crumbling but more on the overly oily side. Also my finished almond cookies so fragile that they get “damaged” -flaky when you try to move them. They look decent but with many cracks. Basically look but don’t touch. Can you give suggestions on where I went wrong? Hi Christina! I assume you used cup measurements (from our previous conversation). I found one mistake in my recipe. AP flour I wrote 1 1/4 cup. 1 cup is 120 grams if you measure it correctly, so 180 grams will be 1 1/2 cup. You probably know how to measure the flour correctly, but in case someone reads this, I will leave the method here so your 1 1/2 cup is not over 180 g.
A properly measured cup of all purpose flour weighs 4.25 oz (120 g). The weight for 1 cup of all-purpose flour varies depends on how you measure it. When you measure flour by volume, please follow the methods below. I’ve tested this method many times, and if you do it properly, 1 cup is VERY close to 120 g each time. I’m so glad that you figured out it was the flour issue. I was being lazy so didn’t weigh the ingredients. (One thing less to put away after washing & cleaning up.) I think I’ll use the scale in the future. Btw, by morning the cookies were more solid to the touch and still very tasty. Hurray for delicious JOC almond cookies! Hi’Nami! Can the dough be freezed and stored for months? Hi Jenny! Hmmm I haven’t tried that before so I can’t tell… sorry! 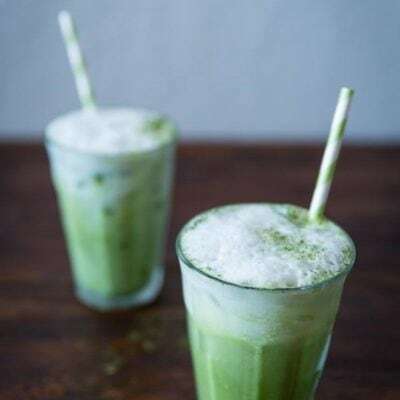 Hey I’m new to this blog and love asian foods (except indian). My dad is especially picky (hates most) about asian foods so anything he likes I try to reproduce at home so we can both enjoy it. About 2 months ago we went to a dim sum restaurant and tried their fried rice (which is the one asian food I usually don’t care for.) I it was dry, savory and slightly red with the reddish pork bits in it, and I can’t believe how much I liked it. 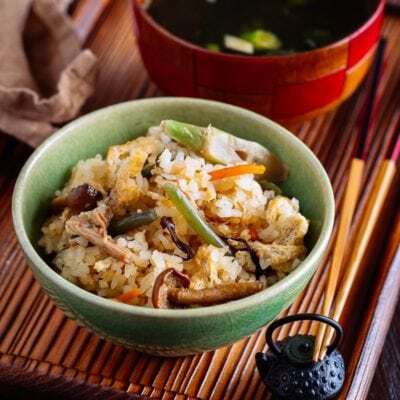 Fried rice is one of the few asian things my dad will eat, but I usually don’t care for it and I thought if I could make this planning dinner would be so much easier. I was wondering if you knew what was in it and could either reproduce something similar or point me in the direction to find the recipe. Thank you for all your hard work and I love your beautiful site. The cookies look great. The following sentence seems to be incomplete in the recipe instructions however. I assume you mean to add more oil. I’ve just been to Maris’ blog and I saw your comment. And I remembered how I used to drop by your blog too! Ive seen a couple of this recipes lately and its a perfect timing since I was wondering how there are made a couple of days ago. I was selling my almond cookies at a fair, when a Chinese lady approached and asked what kind of fat I was using….I reluctantly said lard, knowing that it was the real deal, but not popular, she smiled and took 3 dozen… (she also had a sample). Hi Judy! I use vegetable oil in this recipe, and not butter. I’ve heard that my favorite Taiwanese pineapple cakes (from Taiwan) also use lard. It’s delicious! I have nothing against it. 🙂 In Asian cuisine, we use lard but I don’t see it in American butcher keeping it (maybe we have to ask). 🙂 Your almond cookies must be so delicious!! Thank you for sharing this recipe. I’ve made it a few times and it’s currently my favourite cookie. ???? I just want to know if you’ve ever made it with butter instead of oil. My cookies always turn out very crumbly. Not sure if it’s because of the oil or over baking. I have been making these gorgeous cookies for many times. It’s been a hit every single time. My friends love it and ask for the recipe. The only thing is the amount of oil is varied each time. Sometimes I use less, so I will start with 120ml and judge the consistency from there. Hello! My friend is vegan, but I would love to make this recipe for her. Do you have any recommendations for an egg substitute that would work as an egg wash? I’ve read some online but want to know your opinion! Hi Sonia! I am not an expert in terms of egg-less recipes. 🙁 I think it’s great without egg wash though. It just to give a nice shine to it. It does not affect on taste. 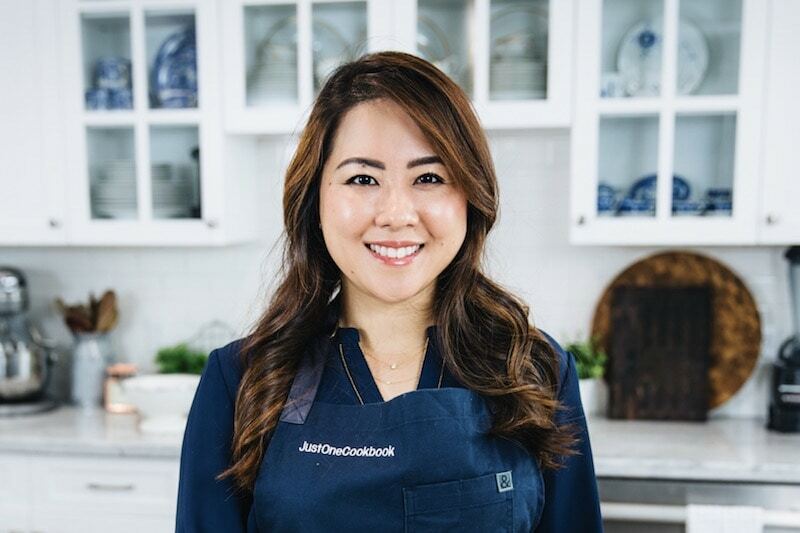 I’m happy to hear you enjoy my recipes and being on this journey with us! Thank you so much for your kind words! Hello Hesper! I am afraid you wanted to make for CNY and I didn’t get a chance to read your comment till now. 🙁 I am so sorry for my late response. To answer your question, yes you can do it. Hope your party was successful, and I’m sorry again for my late response. Happy New Year! Hello Nami! It’s alright! I’m planning to make the cookies again soon for some friends since my relatives really liked them! Thank you so much for the recipe and for answering my question! 🙂 Happy New Year! Recipe yielded very tasty almond cookies. However, the dough was too wet/sticky when I tried to mould it and the cookies end up crumbly. Any suggestions what I can do to improve the next batch? Hi Christina! 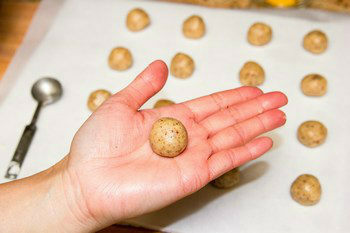 The cookies are supposed to be sticky when making into balls and crumbly after being baked. At Step 4, did you have to add more oil or your mixture was okay? The dough was of correct texture as you described. It just got too crumbly to handle when baked – it just broke apart once someone picks it up. Hello! I remade them today and I realised that the last one failed because I added too much oil! I controlled it this time and it turned out beautifully! I could weigh them properly and made about 49 cookies. Thank you so much for the recipe! 1) I think it could use less oil — 2/3 cup of oil made the dough very hard to handle. Hi Steven! Thank you for trying this recipe and your kind feedback! If 120 grams equals 1 cup, then 180 grams equals 1 1/2 cups (not a half cup). You may want to change that or else there will not be enough flour and the dough will be wet and sticky. I used 1 1/2 cups of regular flour and the dough came out just fine. I also used lard instead of oil. Thank you for the recipe. I wanted to make these for the Chinese New Year. Hi Diana! Thank you for catching this. Yesterday I fixed inside my parenthesis in the recipe. But it’s silly to write duplicate gram measurement in ( ), so whenever I respond comments on my old recipes like this one, I’ve been fixing by removing those extra “=” part in the parenthesis. I guess I deleted “180 g = 1” by mistake! I put back 1…. That could cause a major error… So thank you! No, previous recent commenters are talking about my correct recipe (before I delete 1 by mistake). As I stated in my Notes section, I follow someone’s recipe (linking back to the original recipe), but only change I made is adding 30 ml (2 Tbsp) more oil than hers. I think the reason I had to use more oil is that my almond flour includes the almonds with skin (brown bits), while her almond meal is white and no skin. I think the skin absorbs more oil. 150 ml was needed for me to make into balls; otherwise, it was not combined together. Therefore, I had to suggest “more or less” in notes. My cookies came out great! Very good directions. The only change I made was I used chilled lard instead of oil. I cut it into the dry ingredients with a pastry blender. It made the cookies melt in your mouth! Hi Diana! I’m so glad to hear that! Ohh lard! I think traditionally these Chinese almond cookies are made with lard too. Sounds delicious!